Deep gold to copper color and mildly toasty sweet flavor and aroma. Use 5-10% for enhanced body and malt character in Oktobefest, Altbier and bock; 1-5% for other amber beers. 46° L.
Copper color and moderately toasty sweet flavor and aroma. Use 5-10% for enhanced body and malt character in Oktobefest, Altbier and bock; 1-5% for other amber beers. Imparts fuller body and improved malt aroma to dark beers, particularly German altbiers, stouts, bocks and porters. 130° L.
Sweet berry-nut flavor. Use to add a deep golden hue, light caramel flavors, and a creamy, satiny finish. 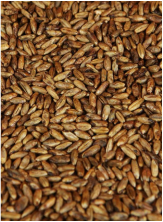 10° L.
Malted wheat that has been steeped and kilned to create a caramel malt. Emphasizes wheat aroma and flavor and adds color; use up to 15% for dunkelweizen and hefeweizen.